Changes to the aircraft carrier project in the 2010 defence review will save £3.4 billion but leave the UK without carrier capability for nine years. "The 2010 Strategic Defence and Security Review has radically changed the Carrier Strike concept. It generated £3.4 billion of savings but introduced significant levels of operational, technical, cost and schedule uncertainty. It will take two years for the Department to reach a mature understanding of the consequences of the decision. These consequences include a decade without an operational carrier and the risks after such a time associated with reconstituting the capability. "The risks to the delivery of the new carriers are compounded by more generic problems with defence acquisition – notably the MoD’s continuing difficulties in balancing its budget." The National Audit Office has expressed deep concern about risks to value for money from the changes to the aircraft carrier and associated Joint Strike Fighter (JSF) aircraft project made in the 2010 Strategic Defence and Security Review (SDSR). 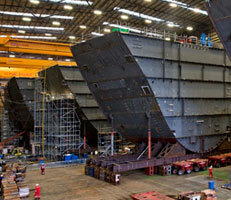 The SDSR decision, in October 2010, was for the MOD to build two carriers but operate only one, pending the next SDSR. This ship will be converted, using catapults and arrestor gear, to fly a different, more capable, version of the JSF to the one previously planned. This carrier will be available at sea only for an average of 150-200 days each year and fewer of the carrier version of the aircraft will operate from the carrier initially, reducing the number of possible daily sorties by more than two-thirds. A decision whether to convert the other carrier will be taken in the next SDSR, planned for 2015. The decision to fit catapults and arrestor gear to the carrier means that the introduction of Carrier Strike will be delayed by two years, to 2020. Given the decision to retire the Harrier aircraft and the existing aircraft carrier immediately, there will be a decade-long gap without aircraft carrier capability. The changes will save some £3.4 billion over ten years. Today’s report highlights the complex inter-relationship between the various cost, short-term affordability, military and industrial factors involved in the Carrier Strike decision. From the papers it saw, the National Audit Office could not understand how those factors were brought together to enable the MOD to reach a judgement on value for money. The NAO identifies two principal risks to value for money on Carrier Strike. First, the SDSR is unaffordable unless there is a real terms increase in defence funding from 2015 onwards. The National Audit Office is worried that the continuing difficulties the MoD is facing in balancing its budget leaves Carrier Strike vulnerable to further change. Secondly, the SDSR decision has introduced more technical, cost and schedule uncertainty. Thinking on the way the carriers will be used in operation is still evolving; and there are major risks reconstituting Carrier Strike capability after a decade without it.